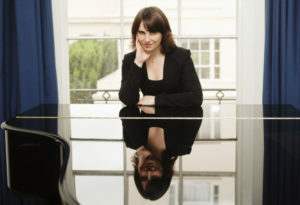 Alissa, who grew up in St Albans after moving from Russia with her composer parents, has built an increasingly successful career as a composer and conductor, as well as a highly-acclaimed pianist. She has recently recorded a composer-portrait of album of her music to be released as ‘Firsova Fantasy’ and is scheduled to appear this autumn as a recitalist for the Amsterdam Piano Series in the world-famous Concertgebouw. Since winning the BBC Proms/Guardian Young Composer competition in 2001, her music has received two world premieres at the Proms. As a pianist, she has recorded ‘Russian Emigres’, an album of music by Rachmaninov, her parents and herself. Despite her growing international fame and schedule, Alissa has continued to make time perform recitals and concertos in her home city, attracting enthusiastic local audiences. The Tchaikovsky concerto, from the dramatic octave chords at the opening to its lyrical slow movement and a fiery, heroic finale has been a favourite with audiences for almost 150 years. Notwithstanding its popularity, it was initially deemed “unplayable” by one 19th century virtuoso and continues to present the soloist with exceptional technical as well as musical challenges. In an all-Russian programme the orchestra under Principal Conductor Tom Hammond will also perform the suite that Stravinsky published in 1945 from The Firebird, which was the first of his great ballets from the early 20th century. Coloured with Russian folk idiom, the music is not so obviously ground-breaking as Petrushka and The Rite of Spring that followed, but it brings its fairytale subject to vivid life with revolutionary scoring and musical effects. SASO’s will open its concert with the fizzing Festive Overture by Shostakovich– a crowd-pleaser since its premiere, despite being written in just three days to fill a gap in a concert to celebrate the 37th anniversary of the Soviet revolution. Click here for information about tickets.